….. you just have to do it! 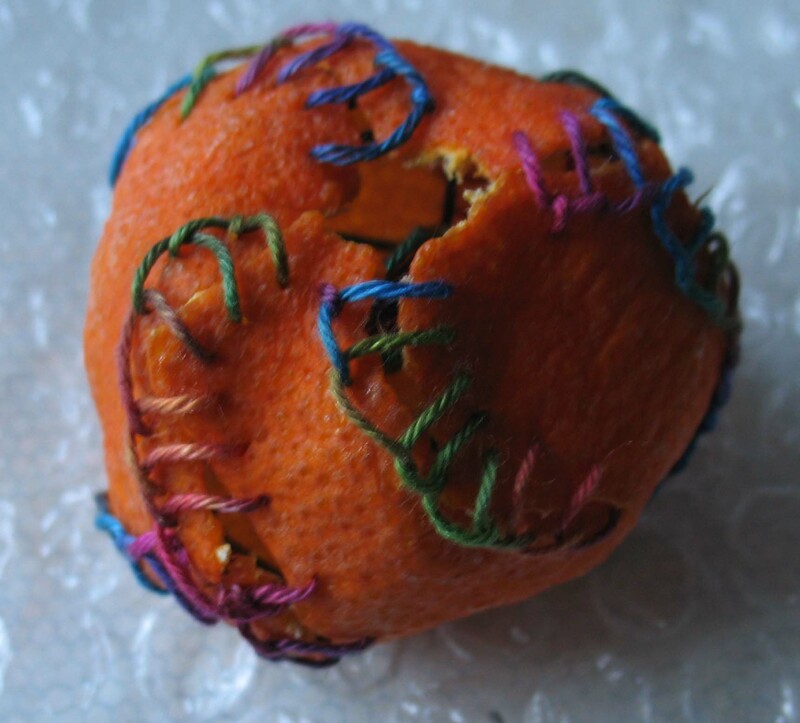 It’s the second week of TAST, Take a Stitch Tuesday. 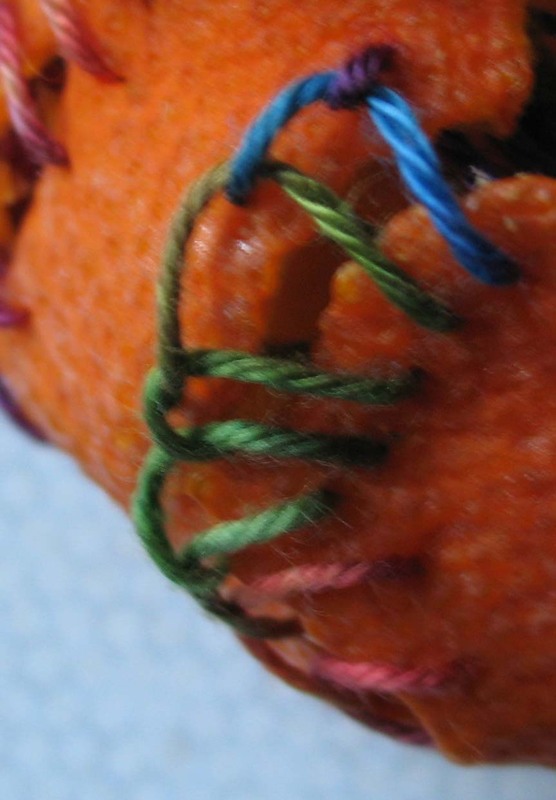 The stitch is buttonhole, which is a useful one, and I have used it on many occasions. So, when I had a really silly idea I just had to ‘go’ with it to see if it would work. I have very little time this week, so it had to be done today or not at all. 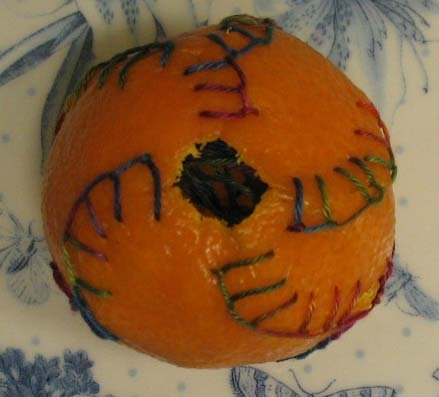 Yes, it is a satsuma. Yes, I did eat the inside. Was it easy? Not very! It’s stitched with a Sassa Lynne hand-dyed coton a broder. The following photograph was added on 12th January. As it dries out the satsuma (which is a different shape to a mandarin, different taste too) you can see that it is starting to shrink. The gaps that are emerging are seen slightly better in the picture below. See how loose the stitching has become? It has shrunk somewhat, and the gaps are becoming quite large cracks now! Well, it was just for fun! Thank you. 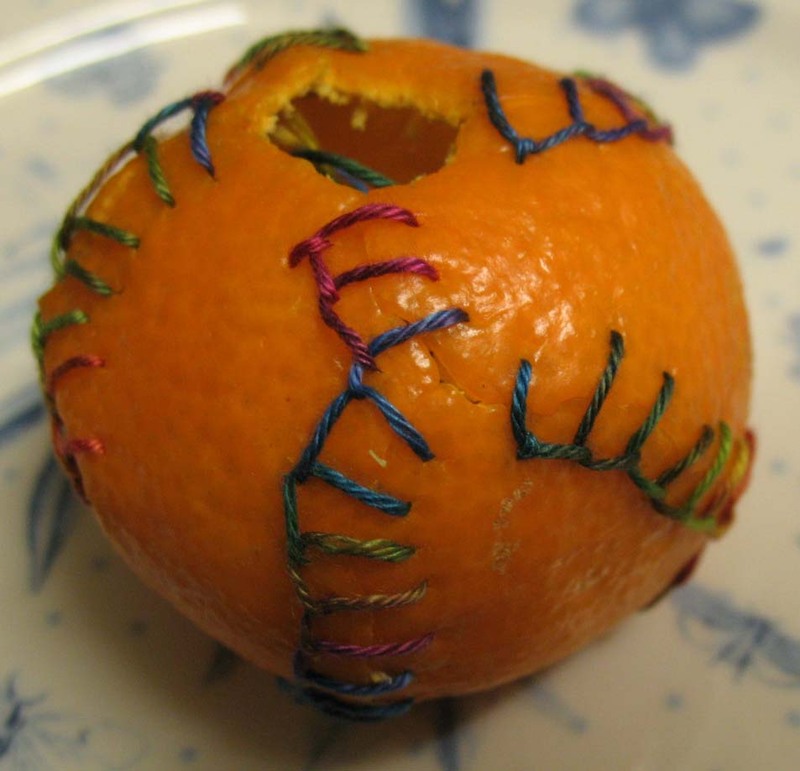 Next time… try baseball stitch, it might be easier. Great concept piece. Unbelievable…great stitch work. I cannot do that. 🙂 What a fun way to practice a stitch! I’d love to see what it looks like in a day or two! I’ll bet your hands smelled fantastically orangey, too. Thanks for sharing! What a unique idea! 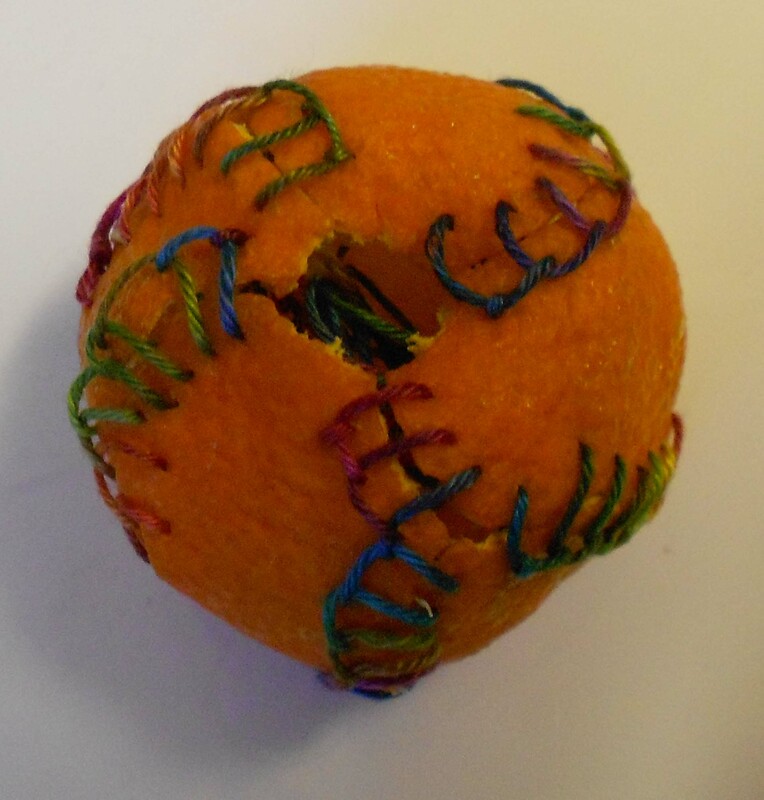 I would never have thought to have stitched on a piece of fruit. Amazingly creative! What a great way to do the stitch. Would love to see the texture as the skin dries out. Just great! I love the idea. Jeanne, thank you. I’ll be over to look. Now that’s lateral thinking! Lovely project! Just for fun! Thank you for your visit, I appreciate it. Well now you know you could sew up a person if need be. Your buttonhole stitch is great! Great idea for thinking outside the box! I want to invite you to enter a show that I am hosting on my blog beginning February 1. The name of the show is Crazy Quilts Are Quilts Too. Please come over and read about it and join in if you wish! You do not have to enter a competition piece to participate but there are some fabulous prizes for those who do enter the competition. 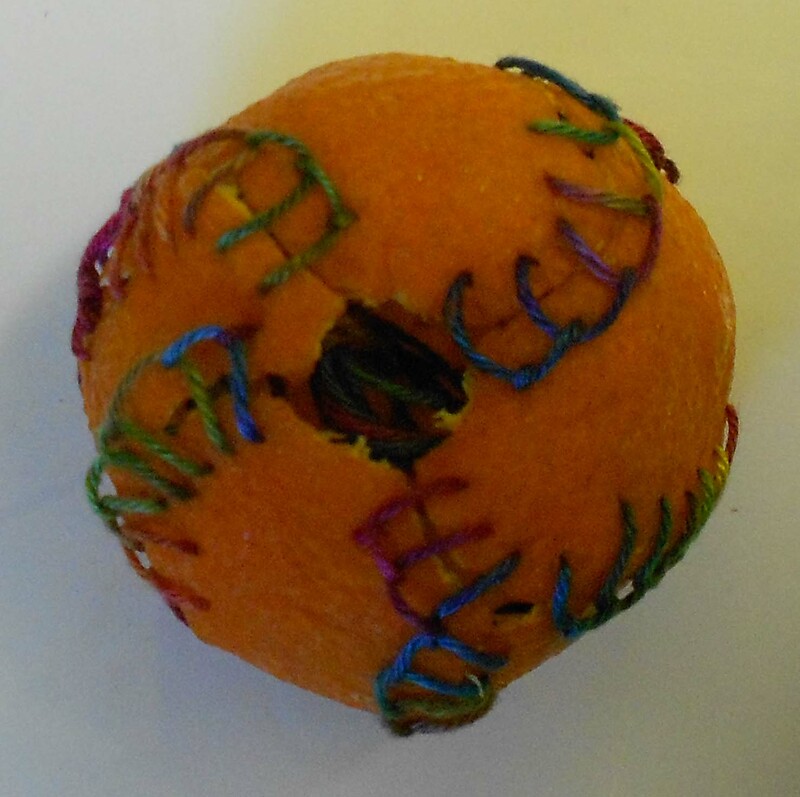 I was feeling a bit down today but this buttonholed satsuma really made me smile. Creativity rating? – off the scale! Absolutley fabulous! That is amazing! At a first quick glance I thought it was a ball. What a very lovely job 🙂 I like satsumas too! Interesting idea . . . I look forward to seeing what the result will be. Previous Post You never know what you will hear. Next Post I won’t go into details…..